IMPORTANT: This addon requires third-party software for keyboard and mouse emulation. Using third-party software is not prohibited by Blizzard as long as it doesn't automate your gameplay. ConsolePort will give you a handful of nifty features in order to let you play the game on a controller - without inconvenience. 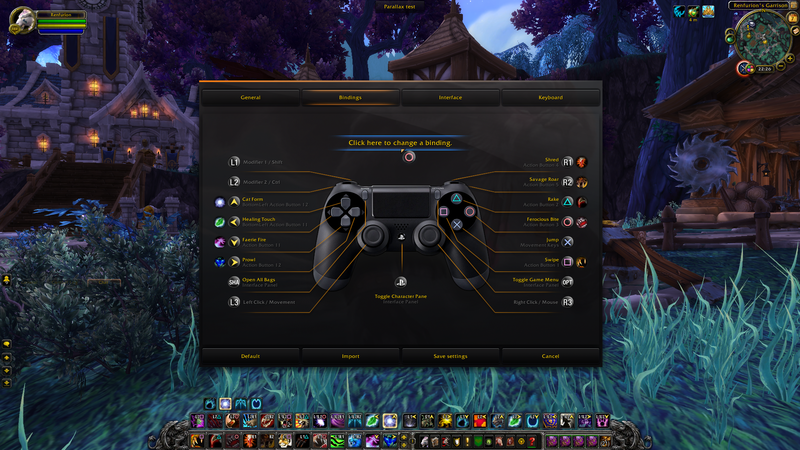 There are a lot of tutorials and videos on how to set up your controller for World of Warcraft, but the most game-breaking part about all of them is how they in no way contribute to an easy game experience. Instead of resorting to macros and gimmicks to make the setup viable, this addon fundamentally changes how the game works. Using the addon, you should be able to effortlessly do the same tasks with a controller as you would with a mouse and keyboard. On top of this, it will NOT interfere with your normal keyboard and mouse setup, leaving you to choose which way you want to play the game without having to rebind and reconfigure every time you change peripherals. 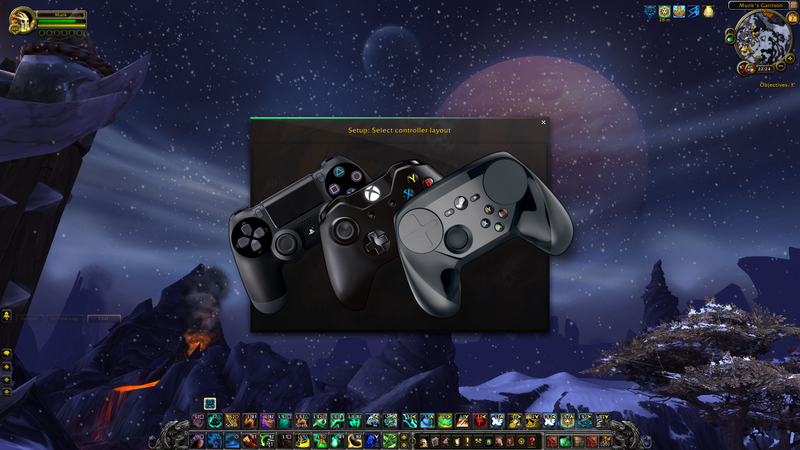 ConsolePort currently supports Xbox and Dualshock 4 controllers natively, courtesy of WoWmapper. ConsolePort is not restricted to those, but it is somewhat restricted to conventional controller layouts. It requires a set of atleast 14-15 buttons, which is what you'll find on any version of the PlayStation, Xbox or Logitech controllers. Currently, the Dualshock 4 is strongly recommended because of its precision and superior mouse curve. Install WoWmapper and start it up. Connect your controller by USB or Bluetooth. Click Plugins to change controller (default is Dualshock 4). Install the addon and start the game. Mouse look is a feature within the game where you lock your mouse cursor in order to control the camera in 3D-space. This state is usually triggered by holding down the right mouse button. ConsolePort utilizes this feature to a great extent to keep you from having to hold down a button on the controller in order to control your character and camera. You can seamlessly use the mouse cursor when necessary, but keep it locked otherwise. Picking up spells, items, macros, glyphs, etc. Using R3 or right clicking. "Interact with mouseover" is triggered. Placing the mouse cursor on your character. 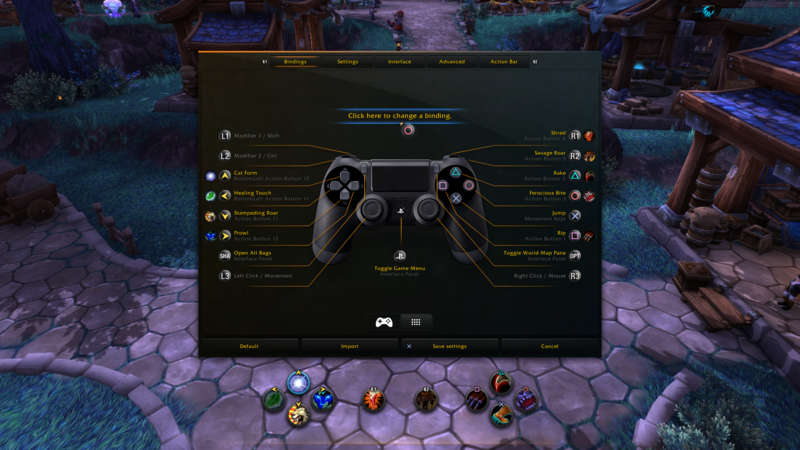 Mouse behaviour can be customized in the interface options to suit your own playstyle. By keeping the mouse cursor centered on screen, it's easy to pick up items, loot mobs and target things in melee range. The virtual cursor is a replacement for the mouse when using the interface. It snaps to clickable and interactive objects across the interface. It is controlled by the D-pad for moving and the right-hand buttons to left and right click. It can be customized to your own liking, and with a bit of know-how, you can integrate other addons to work with the cursor. ConsolePort does not use the normal keybinding system at all. Initially, a wizard will ask you to click the buttons on your controller in order to bind them. Beyond the initial setup, ConsolePort uses its own binding system, which can be found by clicking Controller on the game menu. With 15 buttons dedicated to bindings with 4 combinations each, you have a total of 60 possible bindings. You can expand the amount further by using action pages. The virtual keyboard is a replacement for typing, if you want to skip using keyboard altogether. This unconventional way of typing has a steep learning curve, but is eventually much faster than moving a virtual cursor across a virtual QWERTY-layout. It is controlled by moving the left stick around while pressing buttons on the right hand side. Using L1, L2 or L1+L2 will swap out the character sets. The keyboard has 8 circles with 4 buttons inside them, each containing 4 different combinations. It is highly customizable; it has a total of 128 combinations, and you can change any of them to be whatever you want. Change log can be viewed on GitHub. 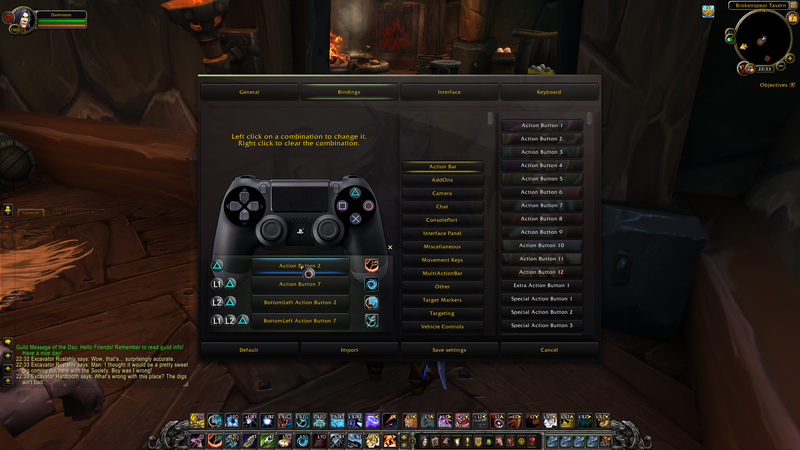 Greetings, just returned to wow after several years hiatus and quickly found your consoleport as the best overall solution for using a ps4 controller. One issue that is currently bugging me to no avail is the tooltips background being blank after you have attacked something. At first I thougtht that it might be related to LUI of which I have used for years after I stopped updating my spartanui variant and so thinking it was perhaaps LUI as the source of the issue I first disabled LUI tooltips. That did not correct the issue.I then disabled LUI completely not just the tooltips and the issue still is present. I also disabled immersion to see if that was a cause and it is not. Last edited by DeathwatchGaming : 02-07-19 at 07:10 PM. 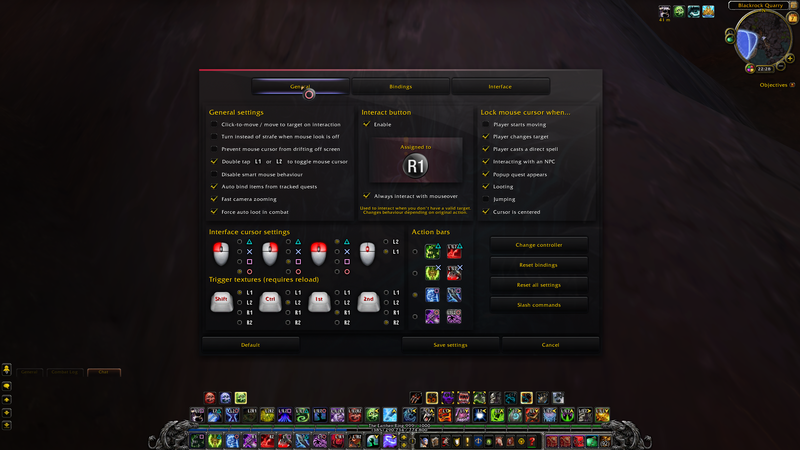 Hi, is there a way to use the menu part of the addon for a keyboard and mouse interface? Since the toc has dependencies for other parts of the addon I'm asking this myself. Thanks for the top quality addon, have a good one! This is a general question about getting a GameStop brand XBOX 360 wired controller to work. I have a laptop running Win 7 Pro and I have installed the XBOX 360 software from Microsoft. My laptop sees the controller, but says the driver is not installed. I have tried reinstalling the driver with no luck. Running joy.cpl yields no luck either. Any thoughts? Should I use a genuine XBOX 360 controller? NVM, I bought a genuine Microsoft XBOX controller and everything is fine. Now I have to figure out how to use the controller. I cannot calibrate my controller... it does not recognize my key presses... I have PS4 controller with DS4Windows running. I use it fine to play ESO, and most steam games. But wow does not recognize it . I only use this addon and no other. My PS4 is connected with the sony bluetooth dongle. i thought I'd chance another request - might it be possible to hide the hotkey text altogether when used on the standard bartender bars? thankyou so much for this awesome mod. Last edited by Boocoo : 07-28-17 at 03:55 AM. I LOVE THIS ADDON SO MUCH! THANK YOU! First I would like to say THANK YOU! This addon has gotten me more exited about playing WoW again! I have been running mythic + and raids pretty easy with the controller now and the more I use it the more I love it! Now for my question I hope you or anyone else maybe able to help me with. I just purchased a Razer Wildcat Xbox one controller (Witch I highly recommend for any game!). If you are not familiar with this controller It is a modded esport controller with 4 additional buttons. My problem is the extra buttons control the same thing as the shoulder triggers and the addon doesnt reconize the extra buttons to bind them to anything. Is there a way I can bind 4 extra spells to these buttons thru the addon? Probably a stupid question but id like to bind things like pots mount and maybe dps cds to these extra buttons. heres a few screenshots fresh install of the addon and only this addon installed no others. Not sure exactly how this happend, but it appears you're missing cursor settings. They should be loaded along with everything else when you first log in and seemingly that's what happens when I do a full reset on my end. /cp resetall will wipe your settings and set everything to default, which should fix your problem. Yes! that did it. That's weird that a fresh install did that. It was an old installation of wow itself though. Maybe there were files elsewhere I did not delete. Thanks either way! Last edited by shorty52732 : 12-03-16 at 02:08 PM. Is there anyway to hide the pet circle completely? I don't want it there even when I'm out of combat. I'm playing an Enhancement Shaman, so I basically don't need to use raid cursor because I'm mainly doing damage. But let's say i'm in arenas and I want to dispell Hex of my partner. Sure, I can make a macro that casts dispel on @party1 or something, but is there a way that when I press dispell, the raid cursor turn on, I can choose a friendly target on the raid bars, select it with the d-pad, dispell the ally, and then automatically return the cursor to default non-raid cursor? Also with DPS that can offheal this would be really good, but I don't want to let the raid cursor on forever, since this is a secondary activity, primary one being DPS. Not possible in the current game API. 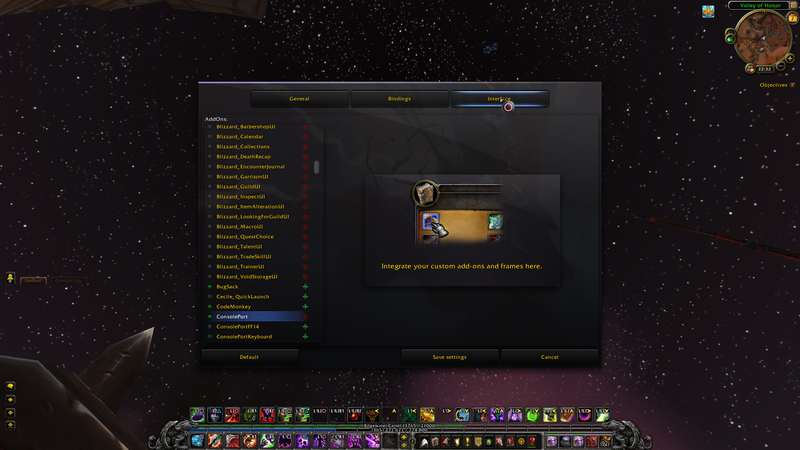 Also, hate to be an annoyiance, but it seems to be a bug with the UI scaling and the addon. If I change the UI Scale for lower or higher than the default (ESC -> System -> Advanced) the bag bugs out (arrow keys don't move around as intended or not even appear). I didnt test this with the raid cursor bug my guess is that this will happen as well. Custom UI scales work fine. The problem is mixing different frame scales, because the cursor calculations will yield the same results even when things don't look the same on-screen. Using a uniform scale should not come with any issues, but if you use other addons that sets a lower or higher frame scale, paired with a custom overall UI scale, you might run into trouble. Same logic applies to unit frames. The raid cursor ignores macros. This is intentional, because macro conditionals are calculated when you press the button, but not before that, which makes it hard to decide whether the spell you want to use is applicable to the current target. It's also designed this way to allow you to designate specific target conditions without having the cursor overriding them. Because the spells only have 3 states - helpful, harmful or neither - it puts limits on ambiguous spells (Penance for example, which can be used both for damage and healing) and a macro fixes that problem. Got it. But is there a way to turn on the raid cursor via macro? Lemme give you an example. Last edited by Hardc0re : 11-19-16 at 01:51 PM. Might be a long shot, but do you have any plans to support a Shield Controller hooked up to the PC? I saw this Addon mentioned in YT videos talking about playing WoW with controller. I'm in bad luck as any controller that is supported, i don't own and GameStream doesn't want to open up WoW normally. But kudos to you, saw it in "action" from YT, and it seems to be really awesome. EDIT: as it is an xinput controller, it does already work. NVM. Last edited by Lolzen : 11-25-16 at 09:36 PM. I'm a broke CompSci student. If you like my work, please help me pay for noodles.